Playoff Preview: Barrie Colts vs North Bay Battalion in Round 2. 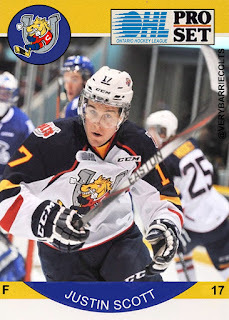 #OHL #BARvsNB - Very Barrie Colts | A website covering the Barrie Colts of the OHL. 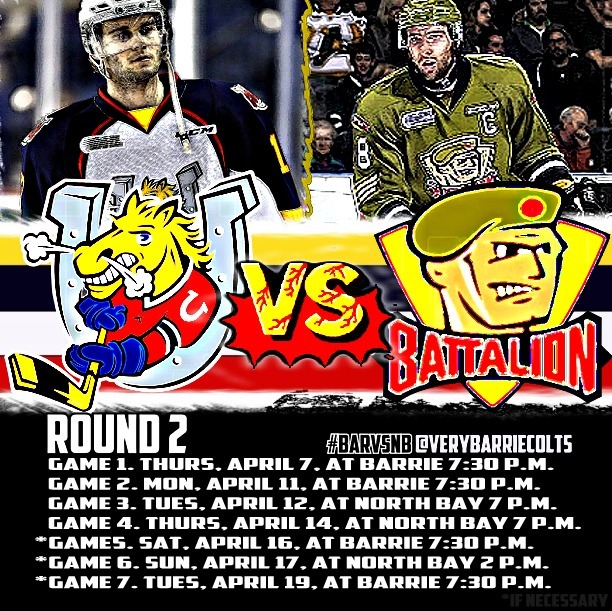 The Barrie Colts (2) are set to face the North Bay Battalion (3) in Round 2 of the OHL Playoffs. Both teams are coming out of hard fought victories that had to go to 7 games to decide a winner. Barrie managed to edge out Mississauga in a series most didn't expect to take more than 5 games. North Bay was in a similar situation in their series but when in a position with their backs against the wall, both teams managed to pull out the big win when it counted most. North Bay won four of the six meetings this season over the Colts. The final two meetings were decided in a shoot out. Both teams won a game a piece in those meetings, while the previous four games were not nearly as close. 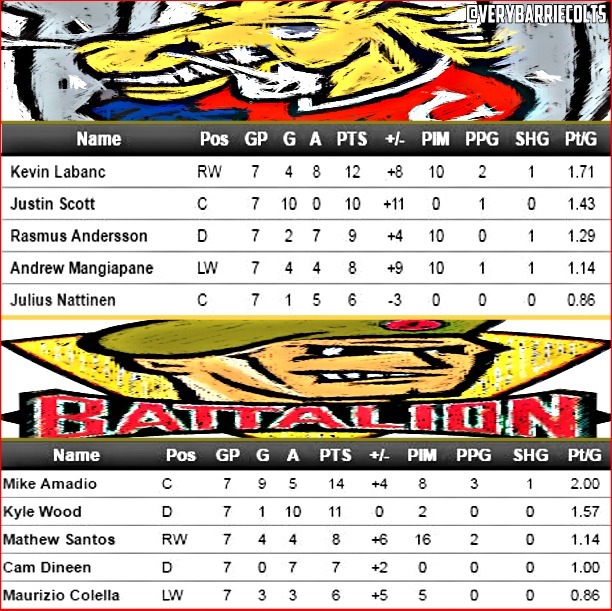 The Colts biggest performance against the Battalion came in the third meeting of the season when they won 12-2. In that game, Barrie put up 6 goals in the first period. It is worth noting that of the 12 goals scored, the team went 0 for 3 on the power play that day. Andrew Mangiapane scored a goal and got 5 assists, while Kevin Labanc put scored a hat-trick and assisted on 4 goals. Ovsjannikov played goal for the Colts and saved 29 of 31 shots faced. In the Series, despite losing for of the 6 games, Barrie out scored North Bay 27 to 26. North bay out shot Barrie 220 to 198 in those meetings and were 8 for 26 on the PP compared to Barrie going 5 for 28 with the man advantage. Here is a look at the top point scorers for both teams in the 2015-16 playoffs headed into Round 2. Mike Amadio and Justin Scott are both at the top of the playoff goal leaders list. Scott tops the list with 10 while Amadio trails with 9. Amadio currently is second in the OHL with 14 points. Here is a look at the top 5 players so far. Same as round 1. Discipline. When Webster, Labanc and Mangiapane are taking (bad) penalties the team stands no chance. 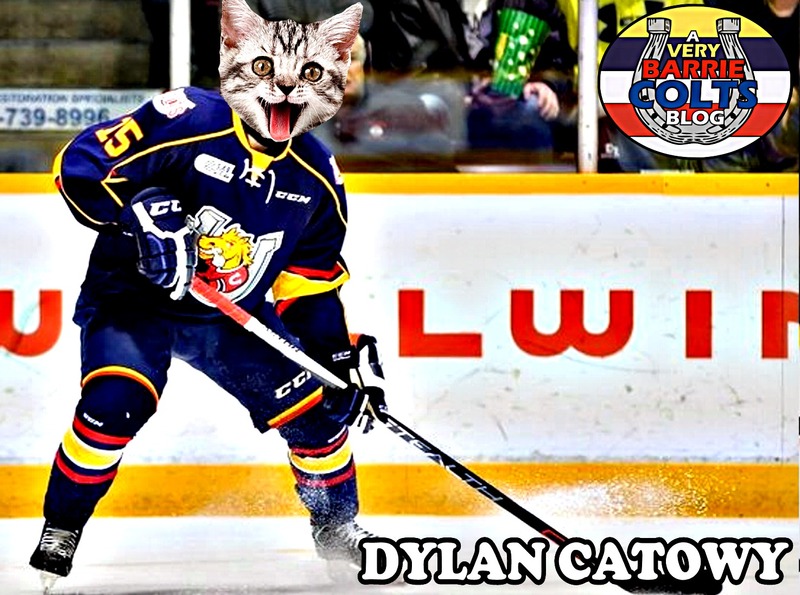 Webster was excellent for the Colts in Game 7. He played a smart game and was less emotional than he seemed in previous games. That really reflected through the roster. The team needs to stay out of the box and find a new structure for their power play. As mentioned earlier, Barrie went 5 for 28 on the PP in the season series with the Battalion. They have to find a way to generate more shots or better looks with the man advantage. North Bay got the better of Barrie this season but this is a fresh start. Thursday, April 7, at Barrie 7:30 p.m.
Monday, April 11, at Barrie 7:30 p.m.
Tuesday, April 12, at North Bay 7 p.m.
Thursday, April 14, at North Bay 7 p.m.
*Saturday, April 16, at Barrie 7:30 p.m.
*Sunday, April 17, at North Bay 2 p.m.
*Tuesday, April 19, at Barrie 7:30 p.m.
How do you think the Colts will do in the second round? Let us know your thoughts in the comments and join the conversation by using the #BARvsNB hashtag and following us on Twitter and be sure to give us a like on our Facebook page!